Posted on Fri, Jan 27, 2012 : 2:55 p.m.
Mitt Romney's gloves were already off before Friday, but he took another swing at Barack Obama upon the president's visit to Ann Arbor. In an open letter to Obama, which is being published in the Detroit News and the Detroit Free Press, Romney says he has one question for Obama: Where are the jobs? From there, the letter turns political. 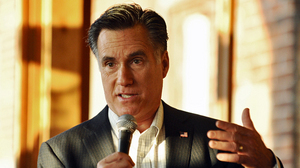 "Mr. President, forgive me for being blunt, but when it comes to economic affairs, you're out of your depth," Romney writes. "Unlike you, I am not a career politician. Unlike you, I’ve spent more than two decades working in the private sector, starting new businesses and turning around failing ones. Undoing the damage you've done will be a daunting challenge." Many political observers are looking forward to a Romney versus Obama matchup in the 2012 presidential race. But in Michigan, Romney will be forced to defend a New York Times editorial titled "Let Detroit Go Bankrupt" that he published during the auto crisis. "If General Motors, Ford and Chrysler get the bailout that their chief executives asked for yesterday, you can kiss the American automotive industry goodbye," Romney wrote in that November 2008 piece. Of course, that hasn't happened, and Obama reminded the crowd of that at the University of Michigan today, making a thinly veiled slam at Romney without using his name. "Some politicians were willing to let this die," Obama said at the Al Glick Field House. "We said no — we believe in the workers of this state. I believe in American ingenuity." Romney has an established career as a Robber Baron and made his personal goal of the 0.0006% club. I guess now he is 'envious' of a career politican and wants to be one himself. Sat, Jan 28, 2012 : 6:38 p.m.
Nobody can &quot;Swiftboat&quot; Newt or Romney because neither of those freedom lovers, who are so fond of endless war, served in the military that they love so much. Did I mention they love the military and freedom? I'd like to know where the jobs are too. All those low taxes that Bush implemented and Obama has continued were suppose to let the &quot;job-creating&quot; wealthy spend their money on creating business and jobs. So, where are the jobs? Sun, Jan 29, 2012 : 4:15 a.m. Yes, it ws a shame Obama was forced to compromise on a critical bill and agreed to a one time extension of the Bush Tax Cuts because he didn't want to raise taxes on the poor and middle class, and the republicans refused to negotiate over the wealthy paying their fair share. He will Not extend it in Jan 2013, however. Sat, Jan 28, 2012 : 4:21 p.m.
Certianly this is about Rommey and not about political party ideas. It's a lesson in how an obivous comment can place your own foot in your mouth.. Sat, Jan 28, 2012 : 4:18 p.m.
Sun, Jan 29, 2012 : 3:08 p.m.
Biden assets are less than 1% of Romneys $250 million dollar fortune. What tax year are you referring to? White House records don't match up with your claim. Sun, Jan 29, 2012 : 12:59 a.m.
JMO, he has given over $6 million to charity (granted around $4m to his church). Biden is around $500 bucks or so. Sat, Jan 28, 2012 : 2:52 p.m.
Romney is right he isn't a career politician, in fact he doesn't work,volunteer or for that matter do anything but collect money for putting people out of work. Sat, Jan 28, 2012 : 2:50 p.m.
All you need to know about Romney can be found in the McCain &quot;playbook&quot; available on line - Mitt is the king of flip-floppers - for gay rights before he was against them, for healthcare for all before he was against it - and goes around saying the poor need to pay more taxes while he makes $20M a year NOT WORKING, and pays a less effective tax rate than the poor. Truly, a sad individual. Sat, Jan 28, 2012 : 2:34 p.m.
Romney's time on Wallstreet, his ties to Wallstreet, his offshore bank account tax shelters, and his refusal to release all of his tax returns, speak volumes about what he is. Though I envy his 13% tax rate. My fed tax bracket is 33%, and that's before Michigan takes their cut. Sat, Jan 28, 2012 : 2:02 p.m. I don't understand why so many people are re-writing history. Go back to Romney's editorial. We did almost *exactly* what he described. We did *not* &quot;bailout&quot; the auto companies. We *did* put GM and Chrysler through managed bankruptcy. We don't know what would have happened if we had bailed them out, because we *didn't* bail them out. The only thing unusual about their bankruptcies was that at the time, because the banks were so weak that we *were* bailing them out, there was no one big enough, healthy enough, and willing, to provide the debtor-in-possession financing. So the government stepped in and provided that financing. That's exactly what Romney was talking about when he wrote, &quot;The federal government should provide guarantees for post-bankruptcy financing.&quot; The proper comeback for Romney's &quot;career politician&quot; remark is that the last President who ran on his experience as a businessman was Herbert Hoover, who led us right into the depths of the Great Depression. Sun, Jan 29, 2012 : 12:17 a.m.
Hoover acted like a Democrat, in getting more people dependent on government funds, and FDR, who succeeded him, liked his idea and really made a power grab, greatly increasing the size of government, a big power grab (and loss of liberty), deepening and prolonging the Great Depression. The less liberty there is in a nation, the less free enterprise and initiative to be an entrepreneur. All because of governmental regulations. Sat, Jan 28, 2012 : 2:07 a.m.
Romney hasn't spent any significant time in Michigan since the late 1960s. Can we stop pretending that he has any real connection to Michigan or its residents? Sat, Jan 28, 2012 : 1:08 a.m.
Bolonie, Go Away, Romney, we aren't buying your story's here. Fri, Jan 27, 2012 : 11:56 p.m. So now it's bad to have an education (&quot;the elite&quot;) AND to have experience (&quot;career politician&quot;). I hate to think where this will lead. Fri, Jan 27, 2012 : 11:17 p.m.
Fri, Jan 27, 2012 : 11:06 p.m.
What an odd quote. Mitt Romney first ran for political office in 1994, Barack Obama in 1996. On the other hand, Romney is more of a career campaigner, having lost several elections while winning one. Fri, Jan 27, 2012 : 10:34 p.m.
You like firing people, don't you, Mitt? but you won't have chance to fire people in GM or Chrysler. Sat, Jan 28, 2012 : 1:12 a.m.
Fri, Jan 27, 2012 : 10:16 p.m.
Stay away from the State of Michigan Mr. Romney. You were born here, but you turned your backs on all of us when you left for greener pastures. You've made it perfectly clear through your statements and actions that you are no friend to any one here, especially the city of Detroit. Fri, Jan 27, 2012 : 10:54 p.m. He even said that in one of the debates. He said he was proud that he left the State of Michigan. Fri, Jan 27, 2012 : 9:53 p.m. I find it interesting that when private companies do the bailing out...its called a hedge fund and those people are &quot;successful&quot; and when the government does it, and its successful, its somehow a problem. Romney is a hypocrite of the first order. His success is guaranteed by his father and those rich friends. His 'bailouts' measured against the automotive bailouts aren't nearly as successful. And he's worried about Obama somehow being a career politician...this is tired rhetoric from a guy I'm tired of hearing from. We have had a financial recession. It take 5 years to get out of those (job being a trailing indicator not a leading one) and t what it most funny is that we're ahead of schedule. This guy, if he's all that successful with economics, should know that. Right now, right here? The jobs are with anyone making something instead of just pushing numbers around on a hedge-find spread sheet. Fri, Jan 27, 2012 : 10:17 p.m.
Fri, Jan 27, 2012 : 9:49 p.m.
Sun, Jan 29, 2012 : 4:05 a.m.
Why was Granholm responsible to jobs in Michigan then if Snyder isn't? Who is? Snyder has given massive tax breaks to businesses paid for with increased personal taxes, new pension taxes, cuts to k-12 and higher education, cuts to local governments, cuts to every social safety net program for the poor, cuts to workers comp benefits and unemployment benefits and on and on all to attract jobs. Where are they? They national rate is 8.5%, Michigan is well beyond that despite the huge giveaway to businesses. Where are the jobs? Sat, Jan 28, 2012 : 4:23 p.m.
Jobs ARE coming back to Michigan. Sorry, I fail to see where Rick Snyder is to blame for the bad economy in the state. we had the first year of positive growth in population since this mess began. By the way, I find it interesting so many 'intellectuals' here have no problem calling Snyder names but would howl like wolves if someone did that to Obama. How about sticking to issues and leaving the name calling for the playground? Fri, Jan 27, 2012 : 9:46 p.m.
Obama shouldn't have signed the NDAA, but even with that, and the show that these republican guys are putting on, it's almost like they are doing everything they can to make sure people with intelligence won't vote for them. Sat, Jan 28, 2012 : 1:56 p.m. Sat, Jan 28, 2012 : 4:39 a.m.
Yep, Paul only lies about his racist and bigoted newsletters. Fri, Jan 27, 2012 : 10:50 p.m.
Fri, Jan 27, 2012 : 9:41 p.m.
Romney is so caught in telling more lies again during the latest FL debate along the lines of the &quot;no I didn't see the ad, but on the ad that I saw it didn't say that&quot; .... but different this time. Just along these lines. So caught up in telling lies, he doesn't know when he's telling them anymore. So sad. Of course, Newt is worse. What a nut-case, he is. Fri, Jan 27, 2012 : 10:49 p.m. Agreed, and then he can always blame his shady investments on his &quot;blind trust&quot;, while he profits from other's misery in the housing bubble burst. Fri, Jan 27, 2012 : 9:34 p.m.
Oh yeah, Mitt, and just what are YOU gonna do differently to create jobs? Homeland Conspiracy That's really, really, funny, and true! Fri, Jan 27, 2012 : 10:27 p.m.
Fri, Jan 27, 2012 : 9:25 p.m.
Yeah, Romney... he would have left Michigan with thousands more jobless and no GM or Chrysler. He's a joke, and only wants to be President so he can say he did it. He has nothing to offer America. Fri, Jan 27, 2012 : 10:18 p.m. The stockholders where the only ones that got hurt with the balil out. Those people ended up with zero. If the auto companies would have declared bankrupsy GM employees would not have lost their job, they would have had to renegotiate their contract. Stockholders would have had a stake and people would have had jobs. This was a total union prop up. Fri, Jan 27, 2012 : 8:57 p.m. Depends how you define &quot;career&quot; I suppose. He's been working at politics full-time since the start of the Century. But, with $20 million coming through the mail slot every year, hey, he's got time on his hands.